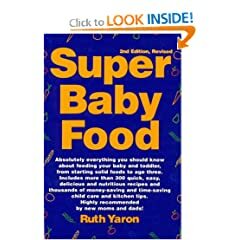 This book has provided invaluable guidance on how to introduce solids and ultimately end up serving your child “super porridge.” The author discusses her experience with how rarely her child gets sick and that other mother’s who follow this approach experience the same thing with their children. So far, my daughter has never gotten more than a runny nose. Her immunity seems very strong so far. I believe that feeding her this porridge is a big contributing factor. Legumes include black beans, red beans, chick peas, lentils, etc. I make a batch about twice a week and it only takes about 15 minutes to make it. I also add liquid supplements of iron and multivitamin, Brewer’s yeast and ground flax seed. Occasionally, when there are good avocados around, I’ll add some of that as well. With how picky babies can be about eating solids, I love that my daughter has a richly nutritious meal every morning. How much my daughter eats of the porridge depends on the batch, but she eats a good amount of it. I think having success with your child eating this is heavily influenced by how early you introduce this sort of diet (they won’t know any better if it’s the only diet they’ve been following). Iron is supplied mostly by the iron supplement drops, but there is also some iron in the egg yolk, brewer’s yeast, desiccated liver, and the whole grains and legumes in the Super Porridge. Milk or other foods from the Dairy group should NOT be given to your baby in this meal, because calcium binds with iron. It is also recommended that baby has one yogurt-based meal per day (lunch) with pureed fruit etc. I’m not as successful in getting my daughter to eat this but, I’m not usually home for lunch. This book received 4 stars from 650 Amazon customers. Click on the image below to purchase immediately. It’s also located in The Store. My daughter started refusing the Super Porridge a few weeks ago so we no longer feed it to her. At around the time she stopped eating it, she got her first more serious cold and she has been fighting a light cold more often than ever. It’s hard to know if it’s directly correlated with her diet, but, my personal experience has also been similar: when I eat healthy, I don’t get sick. So, I’m grateful for all the times that she did eat the Super Porridge and I will be using this book again for future kids. As I constantly revise my daughter’s diet, however, I still refer to this book.